William Hagerman became a professional artist at the age of 13, selling his first paintings to a neighbor, then to another neighbor, school teachers, a piano teacher and by the age of 15 was showing in an art gallery. 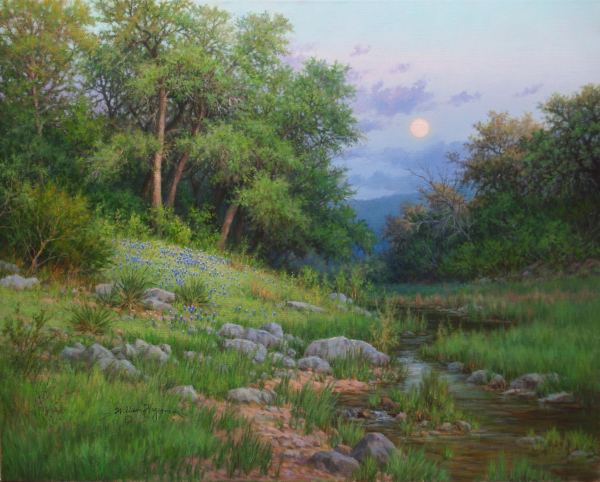 Thirty plus years later William has never put down the brush and continues to paint beautiful landscape imagery that delights the senses. In addition to his own personal studies, William has benefited from artists and non artists alike with several artists of distinction providing guidance early on in his artistic development such as: C.L. Curry, Dalhart Windberg, Robert Pummill and Gary Carter. William also acknowledges the late Tom Ryan for his critiques as well as Wilson Hurly for providing a bibliography of recommended books to further his study William also enjoys teaching and sharing his artistic knowledge through art classes and workshops. He resides in Midland, TX with his wife Rita.